Astronaut Ron Garan, aboard the International Space Station, tweeted (as @Astro_Ron): "Our house guests have arrived! 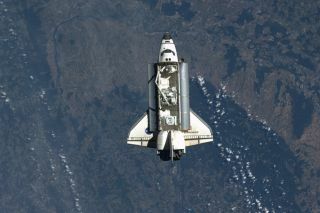 Space Shuttle Endeavour on approach over the Rhine River earlier today #FromSpace." Endeavour docked with the ISS on May 18, 2011 (Flight Day 3). Two ships named Endeavour are taking historic voyages but on very different oceans: One is soaring through space, while the other is sailing the Earth's seas. "The crew of the final flight of the Space Shuttle Endeavour wishes you a safe voyage with fair winds and following seas," wrote NASA astronaut Mark Kelly, who is also a captain in the U.S. Navy, in a letter to his counterpart. "We are proud that our Space Shuttle shares its name with your sailing vessel and all that it represents." Endeavour is currently sailing over Earth while docked to the International Space Station. This is Endeavour's 25th and final mission, which began with a May 16 launch and will end next week when the shuttle lands on June 1. Stern view of the HM Bark Endeavour. Meanwhile, The HMB Endeavour is mid-way through a 13-month trip to circumnavigate Australia, stopping at 18 ports along the way. The ship is a replica of the HMS Endeavour, also known as the HM Bark Endeavour, which was used by British explorer James Cook in a famous three-year voyage that began in 1768, during which Cook and his team became the first Europeans to reach the coast of Australia. That first Endeavour is also the namesake of the space shuttle. The modern recreation of the ship is on an educational mission for the Australian National Museum. The ship's crew is also conducting research on weather and marine climate patterns for the Australian Bureau of Meteorology. "Our two vessels share more than just a name," wrote the HMB Endeavour's captain Ross Mattson. "Our respective Endeavours also represent opportunities for learning and furthering our understanding of the future and the past. Looking forward to how we can interact and respond in space to looking back at past explorers and understanding how it is we came to be." Kelly pointed out that the vessels have one more thing in common. "Our Space Shuttle and your bark also share at least one small material link from early in their lives — the trunnel you see in Endeavour's great cabin was aboard the Space Shuttle Endeavour on its first flight in May 1992," Kelly wrote. "It later became the last treenail hammered into your HMB Endeavour." Mattson also likened Kelly and his astronaut team to Cook and the original Endeavour crew. "I can only imagine what it would have been like for James Cook and his crew of 94 to sail off in to the unknown, beyond the limits of their charts and knowledge, relying on their small Whitby collier Endeavour to get them home," Mattson wrote. "And yet for you and your crew, and all the past Space Shuttle Endeavour crews, this has been something you have intimately experienced."